Misty Meadows Conservation Area and it's hiking trails are a bit hidden, mostly due to it's entrance being obscured by storm damage. The granite sign that once announced the entrance to the conservation area lays face up. 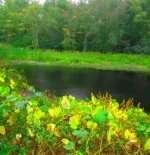 The main trail is obscured as well, with the entrance hidden by vegetation and access is by way of an easement along private property. 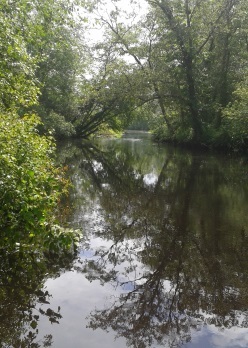 It is a small plot of town owned property with several access points, one being the North River, if you arrive by canoe or kayak! lie in Pembroke as well. 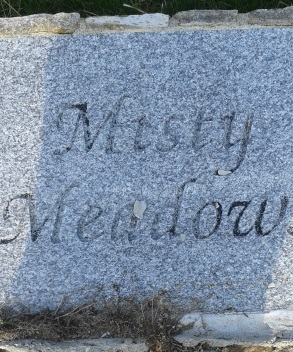 If entering at Ingham Way off Misty Meadow Lane in Pembroke, look for two rock pillars to the right of #34. Park along the street. At these two pillars there looks to be a start to a driveway. The fallen granite sign marking the entrance seems to have been pushed over in one of the hard winter storms of the last few years. 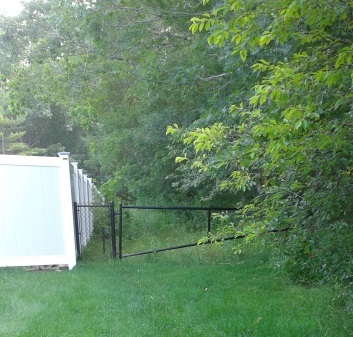 gate to the conservation property. a map and info about the property. 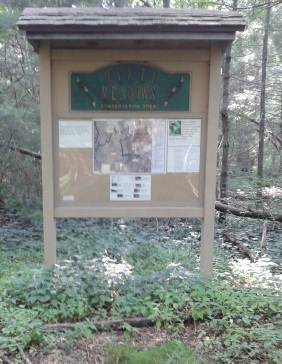 At just over 1/4 mile there is a marker claiming the North River Trail. The trail leads through another rock wall, this one lower. 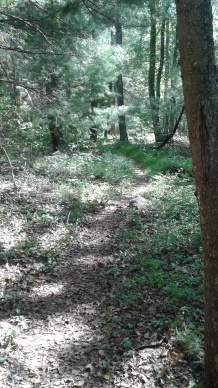 The hiking trail becomes narrow and starts a downhill jog. 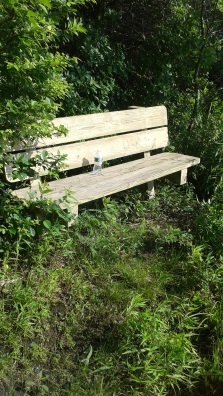 The trail goes through a bit of wet area and then at .42 comes to the side of the North River with a bench. end of the North River Trail. 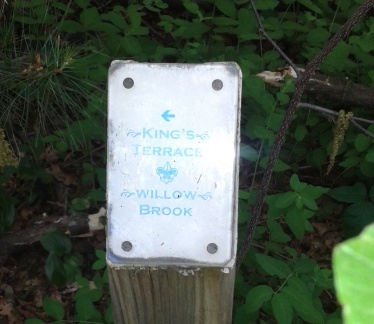 For a longer hike accessing Willow Brook, follow the main trail back to the kiosk and go right at the marker across from the kiosk. Follow til the next marker that points right for Willow Brook. The trail straight leads out to Kings Terrace though becomes a bit faint. Continuing on the access path to Willow Brook Farm, the path starts as a narrow well laid out route but becomes less maintained looking. 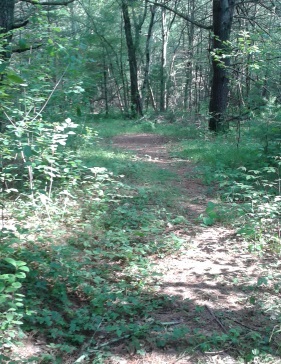 At .90 of the total journey the trail turns right. Then becomes well maintained once again. At .95 the trail runs through a rock wall. At 1.05 there are no markers but a tree wrapped with orange and green ribbons. 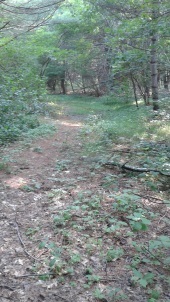 Here the access trail to Willow Brook will take a right. At 1.15 you will notice the trail running parallel to another rock wall. 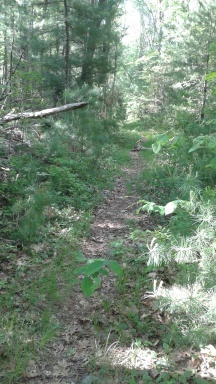 At 1.28 the trail leads away from the rock wall on the left but another appears to the right of the hiking trail. At 1.32 you will come upon a Holly tree. Always a welcome sight in winter! At 1.42 you will come across some large pines that have been cut into logs. At 1.46 you will enter Willow Brook at an intersection. Going right will bring you toward the main part of that property and a Wildlands Trust blaze on a tree lets you know you have arrived at your destination. 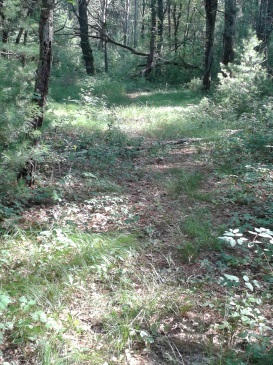 Going to the left will bring you through one of the many meadow portions of this property. Always a nice hike in any weather and a good addition to this initial hike. It will loop back to this same intersection but not before reaching a boardwalk and bridge section that you will arrive at quicker if taking the right when you first enter Willow Brook. 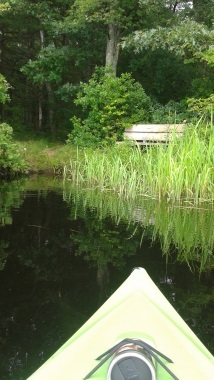 The way into Misty Meadows Conservation does have a feel like you are trespassing, so if you have a canoe, kayak or other means of water transportation, or just want a good rounded out work out, the water access route may be for you. in Hanover or as some just call it the Hanover Launch. Located on Indian Head Dr. off W.Elm St, the sign calls it a car top boat access, but other signage suggests that small motored boats can launch here as well, usually dependent on the tide. 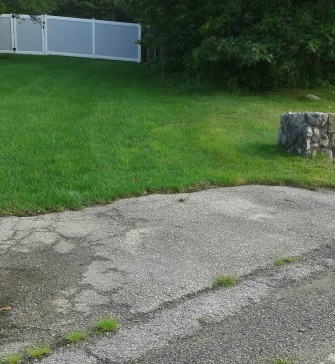 There are two granite slabs at the end of the paved ramp. At high tide time these are completely submerged. 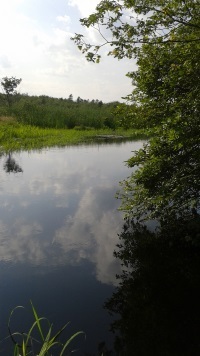 and resembles the water version of a rustic country lane. out and a grassy meadow forms on the right. looks so much shorter on a map to me! 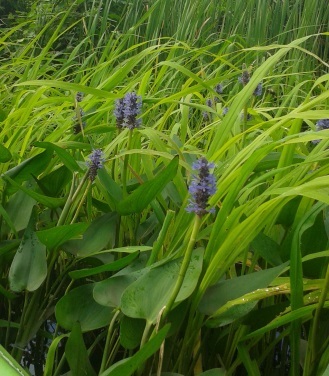 Yet my interest was kept by all the vegetation and wildflowers that were in bloom along the way. 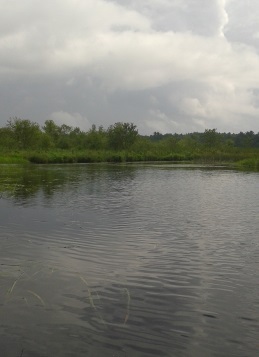 Another factor was the multitude of bird and wildlife found. Many flew over marsh meadowlands to the right. I saw at least two Herons, one found it's lunch on the river! I picked a day that seemed to be a constant switch between sun and clouds. 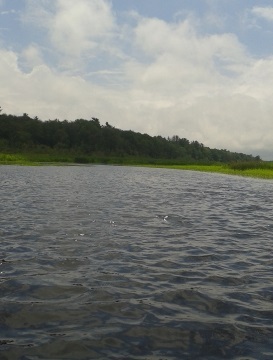 On my map (google) it shows what looks to be an island in the water but when the water is high it is just a large clump of the meadow in the river. It may be an island at low tide. 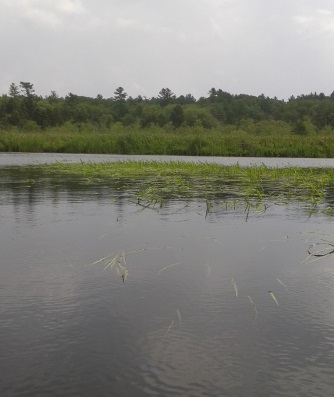 Soon after the "island" the water junction of the Indian Head River and Herring Brook appears. Heading to the left is the start of the North River. 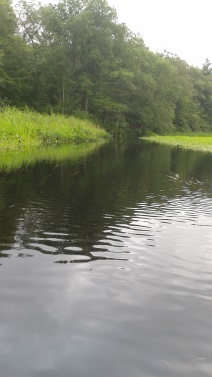 Our journey goes to the right on the Herring Brook. 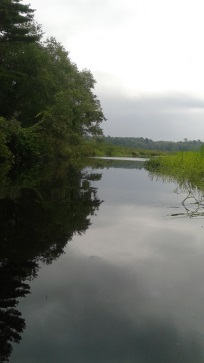 For more info on paddling the North River, the wild turkey paddlers have a nice guide. but soon gets narrower and winding. than expected, but was very pleasant. of the North River Trail! To Trail Head: route 3 south exit 12, follow route 139 west til it's intersection with route53. At the lights with route 53 go left. Take the 2nd right onto Misty Meadow Rd and a left on Ingham Way. 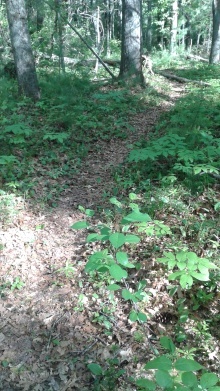 Find # 34, the trail is on the right side of their property. Follow the same directions as above, but at the lights with route 53 take a right. At the next set of lights at Broadway st go left. Shortly down the street W.Elm will intersect to the left, take that. 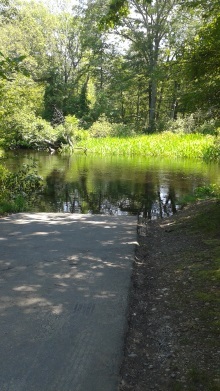 Take the 2nd left onto Indian Head Dr. At the end of the street will be the boat launch AND Iron Mine Brook Trail. Light to Moderate depending what you add on.